This sample 10 day (9 nights) itinerary covers the three capital cities of the Caucasus: Baku, Tbilisi & Yerevan. The services we provide as part of our comprehensive packages include accommodations, transfers and city tours. In addition to the tours included we can arrange a number of excursions based on your own interests. Our Destination Manager in the region provides assistance before and during your travels. They will be available to you leading up to the trip to answer any questions and arrange local services. You will be provided with information on the best these destinations have to offer including things to see and do, restaurants, entertainment and other insider tips. Upon arrival we will provide you with a local cell phone that you can use to contact our Destination Manager throughout your trip. In all of our destinations we offer a variety of accommodation options including boutique style hotels, charming B&Bs and spacious apartments ranging from a three to five star level. From our first hand experience we can ensure they are all clean, comfortable and centrally located. We generally discourage chain hotels but provide accommodations with unique features or an authentic feel. When you arrive, we'll have a driver waiting to greet you. You'll be taken to your accommodation in the capital of Azerbaijan, Baku. Please note that US citizens need a visa to enter Azerbaijan. This is not included in the package but let us know if you need help with this. This four-hour walking and driving tour is a great way to get to know this amazing city. With an expert local guide you'll see all of the highlights of the city center, including the Palace of the Shirvanshahs, the Maiden Tower, Baku Boulevard, and Fountain Square. Then you'll also climb up to Highland Park, where you'll have breathtaking views. Your guide will tell you all about the history and culture of Baku. Don't forget your camera, there are some striking photo opps! Azerbaijani food pays homage to the caravans that threaded the Silk Route. It's unique, delicious and filled with history. We recommend sampling as much as you can while you're in the city, and there's no better way to do so than on one of our guided tasting tours. You'll get familiar with the aromas and flavors of Azerbaijani cuisine on our private Yesil Market Tour, which will introduce you to classic local dishes, sweets and tea. With an expert local guide you'll get to sample some of the most iconic dishes of this delicious cultural cuisine. The mountainous settlement of Khinalig has a truly rare landscape and the unique lifestyle of the villagers combined with this stunning setting makes the place feel like an open-air museum. Khinaliq was historically known as the most isolated village in Azerbaijan. There's a population of 2,000 people who speak their own distinct language. We highly recommend taking the opportunity to visit the region with a local guide on a private tour. We recommend a full-day tour with an expert local guide so you'll get to see some of the most amazing sites in the region. These include the Gobustan Museum of Petroglyphs, about 70 km from Baku. Here you can admire prehistoric rock drawings. Then there's the famous Mud Volcanoes. Over a thousand of these mud volcanoes are known to exist in the world, and some 400 of them are in the coastal area of Azerbaijan. The Bibi-Heybat Mosque is also interesting. Built in the 1990s, it's a recreation of the mosque with the same name built in the 13th century, which was completely destroyed by the Bolsheviks in 1936. A visit to the Ateshgah Temple of fire worshippers should also be on your agenda. The complex is located on the Apsheron peninsula about 30 km from the center of Baku. Finally, you won't want to miss Yanar Dag, a natural gas flame in the hills. This is one of the most popular tourist sites in Azerbaijan. We can arrange a full-day excursion for you, to give you maximum convenience and comfort. The Georgian capital of Tbilisi awaits you today, as well as the opportunity to explore more of Azerbaijan. First, we'll arrange for a private car to pick you up at your accommodation in Baku and bring you to your centrally located Tbilisi accommodation. Along the way you will be stopping at the second largest city of Azerbaijan, Ganja with its picturesque old houses, Djuma mosque and Gei-Imam cult complex. For an additional fee it is possible to add a private city tour in Ganja. The vehicle used for your transfer will be a standard sedan, station wagon or minivan. If you'd like to spend less time on the road we can look into flights to Tbilisi. In case of a direct flight the journey time is only about an hour and 10 minutes, which allows you to spend your day exploring the city. Please note that the direct flights are not available on each day. 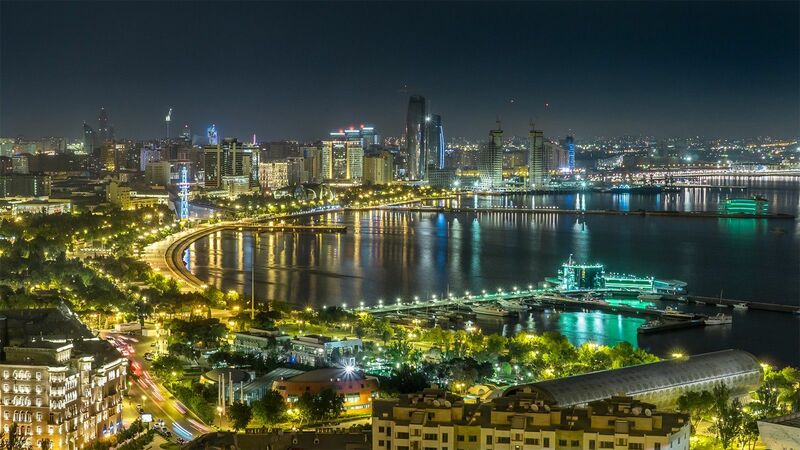 Baku is a glitzy city on the Caspian Sea. It’s expanding quickly with the ambition to become something like the next Dubai. The government is pouring investment into infrastructure and the tourist industry while adding daily flights from foreign countries. Most of the wealth in Azerbaijan is here, and it’s easy to see. But that doesn’t mean there’s no history to explore. In fact, Baku’s Old Town is ancient, yet very well maintained. UNESCO listed the walled city as a World Heritage Site in 2000. The impressive buildings and labyrinthine streets will excite history buffs and anyone who appreciates unique architecture. Depending on how many stops you choose to make on your way, you'll arrive in Tbilisi anytime from mid-afternoon to early evening. Your driver will take you directly to your accommodation in the city centre. The history, culture and legends of Tbilisi will come alive for you on this wonderfully informative walking and driving tour. Your experienced local guide will provide an overview of the history of Tbilisi and Georgia as you explore the charming historical sights of the Old Town. It's the best way to see all the famous places in one easy tour. Georgian cuisine is unique to the country, but also carries some influences from other European and nearby Middle Eastern culinary traditions. Get familiar with the aromas and flavors of Georgian cuisine on our private Tbilisi Foodie Tour, which will introduce you to classic local dishes, wines and spirits while showing you around in the central market. It's highly recommended, especially for first-time visitors to the city because it's a fun tour that's convenient, tasty and very engaging. There is plenty to see outside of the city, and Kazbegi is one destination we highly recommend. Here you'll see the 16th-century Ananuri Fortress and so much more. This historic area is one of the most unique in the region. It's best explored with an expert local guide who can tell you all about its past and present culture. Be prepared for an interesting day today as you say goodbye to Tbilisi, hello to Yerevan and have a brief visit to two Byzantine monasteries Sananhin & Haghpat, the resort town Dilijan and high-altitude lake Sevan. Based on your preferred departure time, a driver will pick you up at your accommodation in Tbilisi and your journey to Armenian capital Yerevan can start. The vehicle used for your transfer will be a standard sedan, station wagon or minivan. If you'd like to spend less time on the road we can look into flights to Tbilisi. In case of a direct flight the journey time is only about half an hour, which allows you to spend your day exploring the city. Please note that the direct flights are not available on each day. Tbilisi has come a long way since the Rose Revolution of 2003 ousted the post-Soviet Shevardnadze government. To Tbilisi's eternal charms of a dramatic setting in the deep valley of the swift Mtkvari River, picturesque architecture, an ever-lively arts and cultural scene, and the welcoming Georgian lifestyle have been added a whole new 21st-century dimension of inviting cafes and restaurants serving ever better food, up-to-date lodgings from backpacker hostels to international five-stars, funky bars and clubs, spruced-up museums, galleries, parks, plazas and whole streets, modernised transport and a sprinkling of eye-catching contemporary architecture. All of which make it a much easier, and more fun, city to visit and live in than it was less than a decade ago. Depending on how many stops you choose to make on your way, you'll arrive in Yerevan anytime from mid-afternoon to early evening. Your driver will take you directly to your accommodation in the centre. This walking tour takes about three hours. You'll stroll through the colorful and magnificent streets of the city center, enjoying the views and learning the history of the most popular sights: The Cascade Complex, the Opera House, Northern Avenue, the Republic Square, the Vernisage Market, Yeznik Koghbatsi Street, Arami Street, and much more. Your guide will pick you up at your accommodation and drop you off there at the end of the tour. The Armenian Genocide memorial complex is Armenia's official memorial dedicated to the victims of the Armenian Genocide, built in 1967 on the hill of Tsitsernakaberd in Yerevan. The people who gather in Tsiternakaberd lay fresh flowers out of respect for all the people who died in the Armenian genocide. This full-day trip is simply packed with historical and cultural sites. You'll see the place where Noah's Ark landed, visit a deep dungeon underground, learn about the 5,000-year history of Armenian winemaking and get to sample some local vintages, and so much more. Your guide will pick you up at your accommodation and drop you off there at the end of the day. You'll want to dress comfortably and bring some snacks and water. The journey is long but well worth it! A driver will meet you at your accommodation to take you to the airport for your departing flight. Yerevan stands out in Armenia because of its distinctly European flair. In the center of this well-developed city you’ll find beautiful architecture, pedestrian zones, grand squares and lovely green parks. 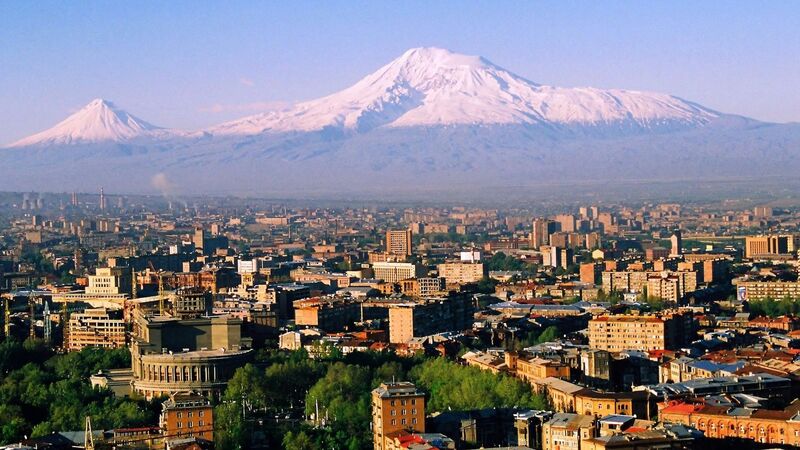 But even in the midst of this urban haven, you’ll see Mount Ararat looming over the rooftops. There are numerous day trips in the countryside just a short drive away. This is a city of art, culture and cuisine. The museums and music clubs are always worth visiting, and the restaurants offer a mix of modern, classic and international dining. The Yerevan Cascade is one stand-out site. It’s a series of landscaped gardens with sculptures and ornate fountains. It also hosts a lively arts center. In fact, you’ll find art and sculpture installed throughout the city. This attests to the local pride Yerevan takes in its culture. 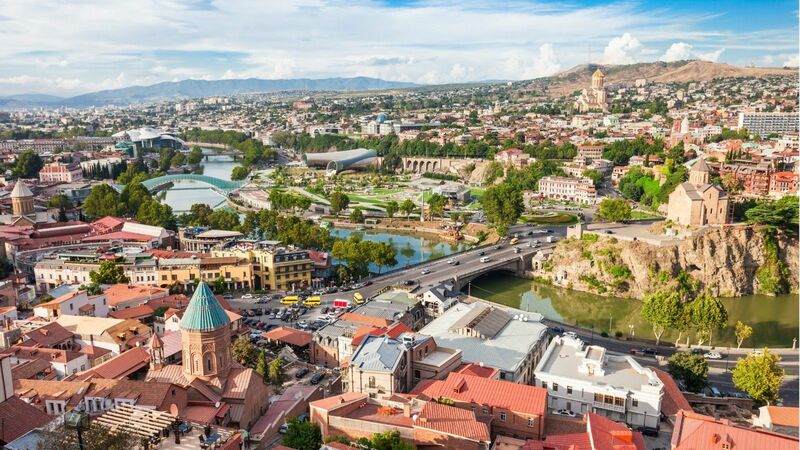 An entertaining destination with affordable prices, Yerevan is perfect for a stay of several days while you’re exploring Georgia.